Home Angel and Rocky Angel Locsin Angel Locsin and Rocky Batara Angel Locsin's version Awards Night Facebook Fan Page my pictures photo with the stars photos PIctures with the Stars social networking site Angel Locsin and Rocky Batara's Picture Together is Most-Liked and Most-Shared in Facebook! 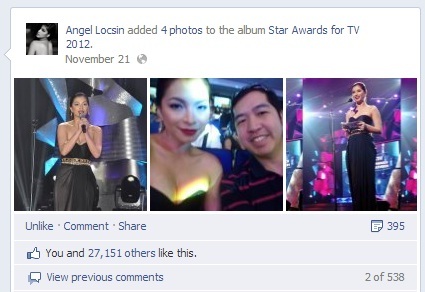 Angel Locsin and Rocky Batara's Picture Together is Most-Liked and Most-Shared in Facebook! For the second time around, I met the country's sexiest and most awarded young actress Ms. Angel Locsin. And this was during the recently concluded 26TH PMPC Star Awards for TV held at the Henry Lee Irwin Theater in Ateneo Manila. Angel was nominated as Best Actress for their weekly sitcom "TodaMax." She together with her co-stars went up the stage to received the award since "TodaMax" won the Best Comedy Program award. Aside from that, her co-stars Pokwang and Robin Padilla also got the Best Comedy Actress and the Best Comedy Actor titles respectively. After their winning moment, I got a chance to talk and mingle again with Angel in our seat. We talked about her latest projects and her upcoming movie "One More Try" which is also the Star Cinema's official entry to the 2012 Metro Manila Film Festival. And of course, we had our picture taking! One of my pictures with Angel is now circulating in the world-wide web. 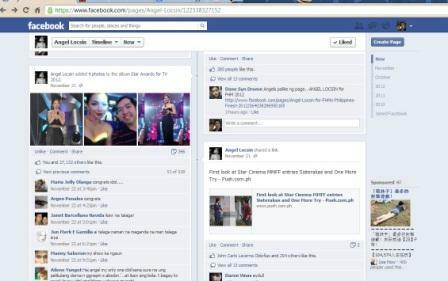 It was even shared in the different social networking sites such as in Twitter and Facebook by Angel's Official Fan Page. And our picture together got the most number of Facebook Likes and Shares. Angel was truly blooming on that said awards night. She was wearing an all-black gown revealing her true beauty!